Yesterday was a pretty special day for Ollie and myself. After having blogged about the Television crew in my house on Saturday the 25th of May I can finally say that the episode has aired. I would have posted this comment yesterday (on the day of airing) but was totally overwhelmed answering caring emails, offers of help and even processing an increase in orders on our website, HopeForOllie.com - endorsed by The Children's Hospital at Westmead and with all net proceeds donated to Duchenne Muscular Dystrophy (DMD) research. I'm so pleased with the positive coverage and for the truly amazing affects this has on raising awareness for Duchenne Muscular Dystrophy. Please share this video and help spread awareness so we may find a cure for DMD and help eradicate this terrible disease spread among boys. James celebrating another beautiful birthday! Friendship, support and compassion are all small components that make up the complex puzzle that is living with DMD. With every milestone, and every birthday, I'm reminded just how important friendship, support and compassion are. While some argue that it takes years to establish deep friendships, it's crazy how difficulties often expedite that process. Since DMD affects only a tiny number of boys, and it evolves as each year passes, finding someone in the same position that is happy to lend an ear is a blessing in disguise. One of the friendships that I've formed is with Sharyn a mother of four and also raising a son with DMD. She and I connected on FaceBook about a year ago and have been sharing stories about our sons ever since. In fact, there is a DMD community here on FaceBook, it is such a huge support network and you learn so much about the every day battles faced by boys with DMD e.g. bullying at school, inability to buy clothing that fits comfortably, how to convert your car for wheelchair access etc. Ollie celebrating turning 3 recently! Sharyn lives in QLD, her son James is 9 and she is an inspiration to me. She doesn't sugar coat anything, which is testimony to her blog. She is happy to answer any questions I have with honesty (e.g. dealing with Ollie's iron and vitamin D deficiency, talking about the splints ollie now wears to bed each night, and even how she explains James' condition to her other 3 children). I am certainly learning a lot from Sharyn and all the other people I have connected with since Ollie's diagnosis 3 yrs ago. Setting up for the interview. Being Ollie’s mum I’m often asked to speak about my experiences and the work I’m doing. Like anyone however it’s never the easiest being thrust into the spotlight, and even more so if it’s for a television interview conducted in your home! On Saturday I was interviewed by Australia’s Channel 9 for a small piece on Ollie. All I can say is that the professionalism and manner in which the process was conducted made myself and Ollie feel very comfortable. The channel 9 interview was fun and Ollie was totally himself in front of the camera. It should air in June. Lights camera action - channel 9 film crew at our place this morning. Yesterday was so much fun! I am so grateful to Spotlight Birkenhead Point for supporting and raising funds for HopeforOllie as part of their annual annual sewing and craft day. Lots of customers came by to lend a hand either cutting, sewing or edging lots of gorgeous polar fleece fabrics and it was wonderful to share Ollie's story with each and everyone of them. I am constantly amazed at people's generosity, it is rather difficult to describe in words, it just gives you such a wonderful happy feeling. Approximately 25 polar fleece blankets were donated - the perfect size for a cot, single bed or stretcher bed at childcare. The Institute of Neuroscience and Muscle Research at The Children's Hospital at Westmead will be given all the proceeds from the sale of these blankets. I can't wait to show you the photos in a week or so!! I hope you are all well. Ollie enjoyed his 3rd birthday earlier this month and was spoilt with lots of toys. He now makes me a pretend macchiato or latte every morning! Happy 3rd birthday to my beautiful little guy! 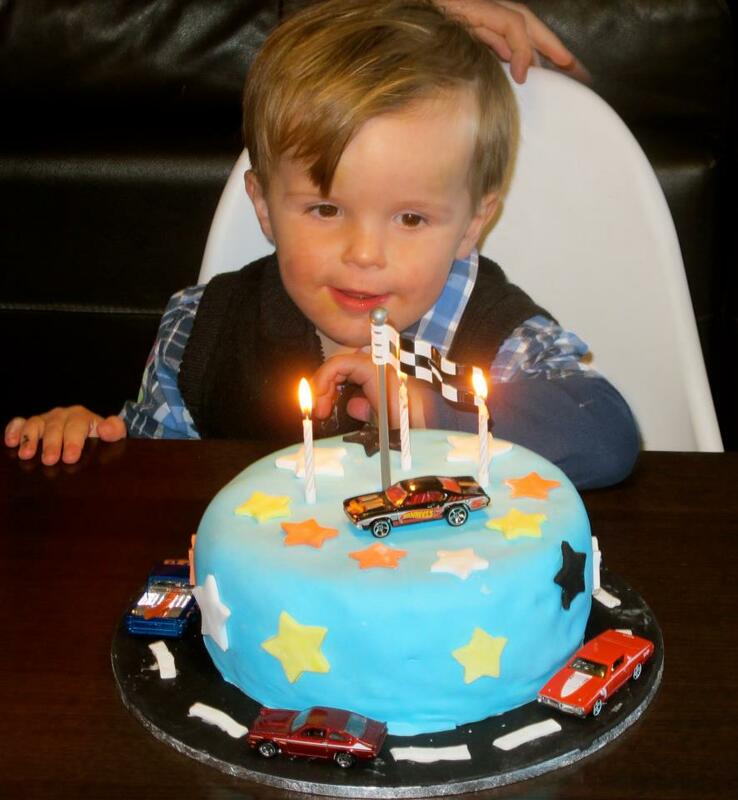 Officially 3 (7th of May, 2013) but he had a great party on Sunday to celebrate. Duchenne’s muscular dystrophy (DMD) is an inherited muscle wasting disease characterized by progressive muscle weakness. This muscle weakness occurs when an affected child’s muscle tissue is unable to produce a structural protein called dystrophin. Without this vital protein, muscles suffer significant damage and eventually die. The progression of DMD causes orthopedic complications, respiratory failure, and heart failure. Boys with DMD are diagnosed in early childhood and are confined to a wheelchair by early adolescence. Because there is no cure for DMD, the life expectancy for a diagnosed child is the late twenties. Although much is known about the cause and effect of DMD, the current treatment options are extremely limited. Daily stretching and glucocorticosteroids are used to delay the progression of the disease. Doctors are also recommending use of blood pressure medications to slow cardiac muscle deterioration. Parents also often seek out alternative therapies to treat some of the issues that occur as the disease progresses. Nutritional supplements, vitamins, and acupuncture are just a few treatments that have been known to help. There are also some corrective forms of treatment that can be used; these include bracing and spinal fusion surgery. DMD is a fatal disease, but there are many signs of hope. Recent stem cell and gene therapy research studies are showing promise for replacing damaged muscle tissue. The cure is getting closer, but more research is needed and that can only happen with additional financial support. The mission of the Romito Foundation is to improve the treatment and quality of life for all persons living with Duchenne’s muscular dystrophy. We will aid current and future medical research and support established non-profit organizations with like interests.